The ceasefire in Ukraine came as a relief after months of intensive bloodshed. The agreement in Minsk came as a joint effort between Europe and Russia, but Washington is thinking about sending arms to Kiev - something that Europe warns will trigger even more mayhem in eastern Ukraine. So what motivates Washington? Why compromise is not something the West seemingly wants? To ask these questions and more we talk to political scientist John Mearsheimer, a professor at the University of Chicago. Sophie Shevardnadze: Professor John Mearsheimer, author, political scientist at the University of Chicago, welcome to the programme - it’s great to have you with us. Now, U.S. isn’t arming Ukraine yet, but it is planning to send military personnel to Ukraine this month. These plans were confirmed by Washington and a government website has an issue to tender for troops logistics. The situation in Ukraine is finally winding down, so - why now? 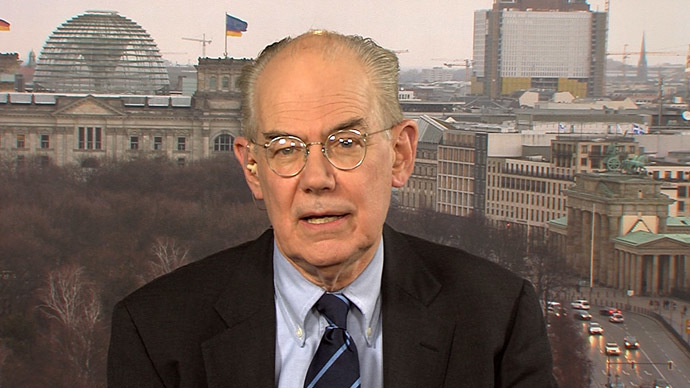 Professor John Mearsheimer: I don’t think that the situation in Ukraine is winding down, even if we have a ceasefire. A ceasefire doesn’t solve the basic problem, and the basic problem involves getting the political settlement. The U.S. believes that to get a political settlement, it has to put more pressure on Vladimir Putin, and the Russians more generally. The West is interested in upping the ante to get Putin to throw his hands up in the air and surrender - so I think that it’s hardly surprising that the Americans were threatening to arm the Ukrainians, threatening to up the sanctions and even threatening to move some military forces into Ukraine for purposes of training of the Ukrainian army. SS:Alright, but if we look at the numbers, we have 300 U.S. troops and 75 UK soldiers in advisory role - I’m wondering if their presence is going to change anything. What are they going to change in the grand scheme of things? PJM: They’re going to change hardly anything. It’s a foolish policy. If the U.S. was to try seriously arm the Ukrainian army, the Russians would just up the ante and in escalation between Russians on one side and Americans on the other side, the Russians would win, and the end result would be that the war inside of Ukraine would widen, more Ukrainians would die and relations between the West and Russia would deteriorate even further. This is why the whole idea of arming Ukrainians is a bad idea and I’m pleased to say that here in Europe most people understand that. The real problem is in Washington, where there are a lot of individuals who do want to arm Ukrainians. SS:You have said that U.S. and its European allies don’t consider Ukraine a core strategic interest - at least not enough to defend it militarily. But now we President Obama has been mulling sending weapons - and that’s still on the table - UK is sending advisors and non-lethal aid, Poland in involved. These actions aren’t serious enough, you think? PJM: The U.S. and the Europeans do not consider Ukraine core strategic interest in the sense that they themselves are not willing to fight and die for Ukraine. There’s no question that the West is willing, under certain circumstances, to send arms and other forms of military aid to Ukraine - but that’s a lot different than going there and fighting. What the West is expecting the Ukrainians to do if they get these weapons is to improve their performance on the battlefield - but as I said to you before, this simply is not going to happen. The Ukrainians are not capable militarily, even with arms from the West, of defeating the separatists who will be backed by the Russians. So, this is a fool’s errand from the start, on the part of the West, and again - we’re talking mainly about Washington here. SS:U.S. Secretary of State John Kerry said: “President Putin misinterprets U.S. actions abroad”, and that the U.S. is not involved in any color revolutions. What is the U.S. doing then? What’s your take on that? PJM: Well. The U.S. general policy - this is the West’s general policy - is to peel Ukraine out of Russia’s orbit and make Ukraine a part of the West, and this strategy has three prongs. The first prong is NATO expansion, the second prong is EU expansion, and here, what’s going on is NATO was moving eastward, the EU was moving eastward, and the ultimate aim is to incorporate Ukraine into those two institutions. The third prong of the strategy is democracy promotion, and what the U.S. is interested in doing and the Europeans as well, is toppling regimes in places like Ukraine, that are pro-Russian, and putting in their place regimes that are basically pro-Western and anti-Russian, and that is exactly what happened on February 22nd, 2014, when the Yanukovych regime in Kiev was toppled. Yanukovych was basically pro-Russian, he was forced from power - it was effectively a coup-d’etat, and in his place you got a regime that is pro-Western. The Russians, not surprisingly, given NATO expansion and EU expansion, consider this to be categorically unacceptable, and the end result is that Putin took Crimea and he’s now in the process of going to great lengths to wreck Ukraine, because he’s not willing to let Ukraine become part of the West. For the Russians, unlike the Americans, the Ukraine is a core strategic interest, it’s a vital strategic interest, and Putin has no intention of allowing Ukraine to become part of the West. He’s basically saying to the West, and he’s saying to Kiev: “If you don’t back off, if you don’t stop pursuing this policy of westernization inside of Ukraine, I’ll wreck Ukraine instead”, so if there’s any hope of settling this mess, what’s necessary is for the West to stop trying to incorporate Ukraine into its orbit. SS:But I think that the most acute part of westernizing Ukraine is obviously NATO part, the NATo expansion, and like you’ve said, one of the core problems is NATO’s expansion eastwards. There is no way that Washington didn’t understand that Russia would push back, like you’ve said, I mean, everyone talks about, you know, “it’s Russia’s strategic interests that are threatened” and there’s no way that Washington didn't understand that when they were pursuing the goal of NATO expansion towards Russia - so why provoke this confrontation? PJM: Well, you would think that what you’ve said is true, you would have thought that the West would have understood that trying to incorporate Ukraine and Georgia into NATO was a prescription for disaster. You’d want to remember that it was April 2008, at the Bucharest NATO summit, where NATO announced at the end of the summit that Georgia and Ukraine would become part of NATO. A few months later, in August 2008, we had war between Russia and Georgia over this very issue. Here was a clear signal that Russians were not going to tolerate Ukraine or Georgia becoming part of NATO - but the fact is that Washington refused to believe Russians, and Washington continued to believe that it could pursue policies designed to make Ukraine a western bulwark on Russia’s doorstep, despite the fact that Putin and his predecessors told the Americans and told the West Europeans that this was unacceptable. So, amazingly, the West was actually, totally surprised by what happened after February 22nd, 2014, as you point out, they should not have been. SS:But NATO never really publicly abandoned its goals of bringing Georgia and Ukraine into the Alliance. Is the issue still on the table? PJM: Of course the issue is still on the table. This past December, the Ukrainians pushed through legislation that will now allow them to pursue NATO membership - this was remarkably foolish, and at the same time, people in the West have done nothing to allay Russian fears about NATO expansion into Ukraine; this is why this crisis is not going to be settled anytime soon, and, if anything, it’s likely to get worse. The only way you’re going to solve this crisis is to start by taking NATO expansion and EU expansion off the table. SS:Now, last month’s agreements in Minks were a success - I think they were - there are talks that are being planned, new talks are going to be planned, and also the possible use of peacekeepers is being discussed. Europe - and I mean France and Germany - is at least, partially, embracing this de-escalation. Is the U.S. ready to ease tensions with Russia as well? PJM: I think there’s no question that what happened in Minsk is a step forward. I think it looks like, at least for the foreseeable future, you’ll have a ceasefire of some proportions on the ground, but the real problem here is that you don’t have a political settlement that puts this problem to rest once and for all. What we need here is some sort of agreement, some sort of deal between the Russians on one side and the West on the other side that solves the Ukrainian problem. I think to achieve that end, again, you have to take NATO expansion and EU expansion off the table, the Americans have to get out of the business of “democracy promotion” in places like Kiev, and, more generally, you have to turn Ukraine into a neutral buffer state - and until the West is willing to pursue that policy, I see no end to this crisis. So, I don’t think Minsk-2 is going to solve this bigger problem. SS:But there’s a slight problem, though: do you really think that Ukraine wants to be turned into a buffer state, or a buffer zone? PJM: Well, if Ukraine wants to survive as a functioning state, that’s the only choice that it has. As long as Ukraine continues to think that it can become part of the West, it’s going to pursue a policy that is in my opinion suicidal. Some people say that I am anti-Ukrainian that I am hostile to the Ukrainian people and I think that Russia has the right to run Ukraine - this is not my view at all. My view is that the policies that the West has been pushing, NATO expansion, EU expansion and democracy promotion, have been disastrous for the Ukrainian people, it’s created this present mess that they’re in. Ukraine would be much better off if it were a neutral buffer state. The Russians would care much less about it, and they would be much more inclined to leave it alone; and furthermore, there’s no reason that the Russians then couldn’t work with the West and with the IMF and with Kiev to turn the economy around in Ukraine and make it economically flourishing state. But if you continue the present policy - that’s not going to happen. SS:You proposed that Ukraine should be made a buffer zone, and that, first and foremost, that would be the best thing for Ukraine right now, but how do you actually make that happen? PJM: You’d want to remember that what I’m calling for here is basically restoring the status quo before the February 22, 2014 coup. From 1991, when Ukraine declared its independence, up until early 2014, Ukraine was effectively a neutral buffer state between the West on one side and Russia on the other side - so we’re talking about the return to status quo ante. The question is how do you achieve this end? What’s necessary is for the West to adopt to a fundamentally new policy, which is to stop trying to incorporate Ukraine into the West, stop trying to make it part of NATO, and stop trying to make it part of the EU. I think its almost impossible at this point in time to imagine the West pursuing that policy. I don’t think they’re going to turn the ship around and adopt this policy of making Ukraine a neutral buffer state - and that’s for that reason I don’t think this crisis si going to be settled anytime soon, and I actually think that over the long term, the crisis will get worse. SS:You know, this crisis that we’re talking about, the Ukrainian crisis, is often considered to be a crisis of U.S.-Russia relations. Certainly, that’s the way a lot of people perceive it here in Russia. Is it? PJM: I think there’s no question about. It’s a multi-dimensional crisis, it’s a crisis between Ukraine and Russia, it’s a crisis between Russia and Western Europe, but it’s also a U.S.-Russian crisis, and many people in the U.S. say quite correctly - it’s the worst crisis between these two powers since the Cold War, and it’s a crisis that has significant consequences for U.S. on variety of fronts, because the U.S. needs Russian cooperation on all sorts of issues. For example, the U.S. needs cooperation from Russia to deal with Iran nuclear problem, the U.S. needs cooperation from Russia to deal with Syria, the U.S. needs cooperation from Russia to deal with its exit from Afghanistan, the U.S. needs cooperation from Russia to deal with China - and instead, what we’re doing is driving the Russians into the arms of the Chinese. So, this is a remarkably foolish policy for a whole variety of reasons for the U.S. But as I say, it’s not only crisis that affects U.S.-Russian relations, it also affects other dimension of the problem as well. SS:We’re going to talk about China a bit later, but first, I want to clarify something - you’ve said that Russian leaders fear that they may be next in line when it comes to Western social engineering policies, like in Ukraine, for example. Do you really feel that Washington believes such scenario is possible today, in Russia? PJM: I do think that they think such possibility is in the cards. I think, one of the reasons that we are upping the pressure on Putin, they reason that we’re willing to countenance greater sanctions, and even think about arming the Ukrainians - is because we think in the end, there’s some possibility that we could topple Putin from power. The U.S believes very powerfully that democracy is an important force in world politics, and that countries like Russia, countries like Ukraine, desperately want democratically elected leader in place, and they think that Putin has all sorts of legitimacy problems, he’s not terribly strong in his position inside Russia, and they believe that if they put significant pressure on him, there’s possibility that they could topple him. And by the way, in September 2013, there was a opinion bit in Washington Post by Carl Gershman who heads up the Endowment for Democracy promotion, who was making the argument that Putin might be next - so you don’t want to underestimate the extent to which some Americans believe that Putin could ultimately be toppled from power. SS:But, on the other hand, the U.S. still needs Russia and you’ve mentioned this too: there are issues like Afghanistan, Iran’s nuclear programme, Syria, and moreover - fighting the Islamic State. So is the Middle East more important for Washington than European matters, what do you think? PJM: I think that it’s hard to say whether the Middle East is more important than Europe is for the U.S. I think that historically Europe has been the most important area of the world for the U.S. When you think about the areas outside of the Western hemisphere that the U.S. cares the most about, it has historically been: Europe’s first, Asia second, and the Persian Gulf third. We are about to undergo a fundamental transformation in our grand strategic thinking in the U.S. - for the first time in our history, Asia will become the most important area of the world for us, and this is because of the rise of China. The Persian Gulf will become the second most important area because it’s linked so closely to Asia, because of oil, and Europe will drop to a distant third. So, Europe is becoming increasingly less important in the American strategic mind over time, and you’d want to remember that Americans are committed to pivoting to Asia, and when you pivot to somewhere, that means you pivot away from another area, and the area we’re talking about pivoting away from was Europe. So this crisis over Ukraine really caught us off-guard, and as long as we remain involved in Ukraine, it would be difficult for us to pivot to Asia, which is more important strategic area of the world, than Europe, and again, as I said, I think the Persian Gulf is inextricably linked to Asia and therefore it too is a very important area. SS:So, with Persian Gulf area and the whole Middle East area moving to the second position according to importance of topics for America, could we see a barter exchange between Russia and the U.S.? Let’s say, trading the issue of Syria for Ukraine, for instance? PJM: No, I don’t think in those terms. I think a better way to put it is just to understand that the U.S. has a vested interest with having good relations with Russia for purposes of dealing with China in Asia and for purposes of solving its problems in Middle East, whether you’re talking about Syria or you’re talking about Iran. So, I think what the U.S. wants to do, is that it wants to go great lengths to smooth its relationship with Russia, end this crisis over Ukraine, so that it can cooperate with Russia over China and over Iran, and over Syria. SS:Why do you think it is so dangerous to actually have Russia and China closer together? PJM: The fact is that China is growing economically at a very rapid pace and because it has more than 4 times as many people as the U.S., if it had a per capita GNP that looked anything like South Korea or Hong-Kong, it would be economically and militarily much more powerful than the U.S. The U.S. is going to have its hands full, trying to contain China over the long term. Of course, we’re assuming here that China will continue to grow economically, but assuming that that happens, the U.S. is going to have a very difficult time containing China, and it’s going to need all the help that it can get. It is going to need help from countries like Japan and India and Singapore and Vietnam, but it is also going to need help from Russia, and it makes absolutely no sense to drive the Russians into the arms of the Chinese, which is exactly what’s happening as a result of this dispute over Ukraine. SS:Now, U.S. diplomacy all too often seems not so much in negotiation but really dictating terms, sort of like, “if you doesn’t go our way, we’ll send weapons to Ukraine, we can bomb Iran” - “no options on the table” sort of approach. Why does the U.S. talk from the position of force very often? Because it can? PJM: The U.S. believes that it is, in the words of former Secretary of State Madeleine Albright the indispensable nation: we believe that we stand taller and we see further than most other countries. There is the sense in the U.S. that it has a right and a responsibility to run the world, and it also thinks that because it is incredibly powerful both economically and militarily, that it has the leverage to push other states around and get what it wants. So, the U.S., since the end of the Cold War, has not been really interested in diplomacy, because diplomacy involves compromise, and the U.S. is not into compromising these days. The U.S. likes to dictate the terms of any settlement that it has with any other country. It only very reluctantly comes to the point where it will make a compromise. And, I think, with regard to the Russians, because the Russians were so weak in the 1990s and in the early 2000s, that the U.S. got used to pushing the Russians around, it got used to thinking that it could get its way with the Russians, that it could dictate terms of any settlement to them - and for a while, we basically got away with that, we were allowed to push the Russians around, that’s why we got the first expansion of NATO, without any trouble, that’s why we got the second expansion of NATO in 2004 without any trouble - but now the Russians are pushing back and we, therefore, we meaning the Americans or the West, are going to have to compromise to get some sort of settlement over Ukraine, but it’s very hard at this point in time to get the West, especially, Washington, to compromise. SS:Professor, thank you very much for this interview. We were talking to professor John Mearsheimer, political scientist at the University of Chicago, also an author. We were talking about the crisis in Ukraine and where Russian-American relationship stands in regards to that matter. Also, talking about China as a rising threat to America that could be hard to contain in the future. That’s it for this edition of Sophie&Co, I will see you next time.